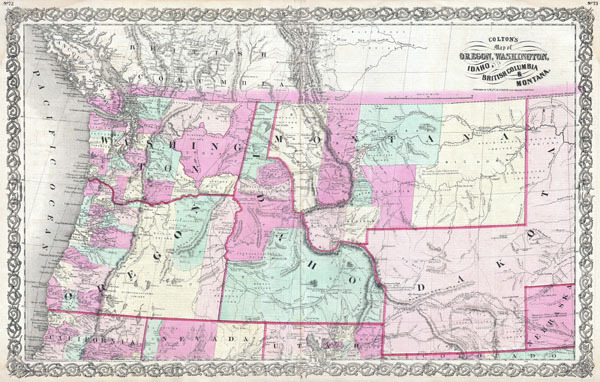 This is a scarce and unusual map of the northwestern part of the United States issued by J. H. Colton in the 1866 edition of his important General Atlas. This map first appeared in the 1865 issue of Colton's Atlas and was subsequently updated in the 1866, 1867 and 1868 issues, before being retired in 1869. Covers Washington, Oregon, Idaho, and Montana as well as modern day Wyoming and parts of Dakota, Nebraska, Utah, Nevada, California and British Columbia. Predates the creation of Wyoming Territory and consequently Wyoming is shown as part of Dakota Territory. Montana features a number of newly created counties including Big Horn, Gallatin and Missoula. Details several important roads and routes including the Cherokee Trail, Pony Express Route, Overland Mail Route, a proposed route from Gallatin City to Ft. Laramie, and the proposed route of the Union Pacific Railroad. Also covers the explorations of Fremont (1842 & 1845), Stansbury (1849), Donelson (1853), Arnold (1853), McClellan (1853) Mullen (1853), Stevens (1853), and Warren (1855). Depicts forts with small flags and notes many American Indian tribes, gold deposits and geological formations. Features the typical Colton scrollwork border. Like most Colton maps it is dated and copyrighted 'According to Act of Congress in the year 1855,' but was in fact published over 10 years later. Colton, G.W., Colton's General Atlas, (1866 editon). Very good condition. Extrememly minor water stain upper right and left corners - mostly confined to outer margins. Text on verso. Original centerfold. Piquette, C. M. , Indexed, Annotated Cartobibliography of the University of Montana, Mansfield Library Historical Map Collection, no. 150.